Triple edged eyeliner application tool in a compact with a 5X magnifying mirror and a suction cup. 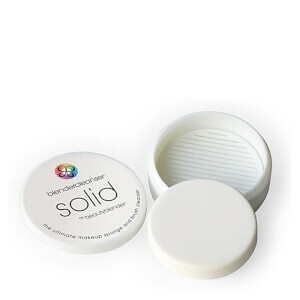 Provides a straight edge that will stay in place when gently pressed against the skin. Assists in achieving symmetrically lined eyes. Three different sides devised to help create different angles and liner shapes. Attach compact to hard surface at eye level. Rub liner designer between your hands to warm up the eyeliner tool for 10-15 seconds. Place pointed corner of you eye when applying a pencil or liquid eyeliner. For a more dramatic effect, use the long, straight side to draw out and elongate a curved, long wing. For a subtle cat eye, use the shorter curved side to create a straighter wing. use liner designer to line the bottom of the eyes by using the larger curved side applying liner to the bottom inner and outer corners in a smooth clean line.